Oppo, on Wednesday, launched the R17 Pro priced at Rs 45,990 in India. The smartphone is also the first with a Snapdragon 710 chipset in India, but what makes it stand apart is its charging tech. The Oppo R17 features the company’s proprietary VOOC Flash Charge technology, which as per the claims charges the phone from 0-40% in just 10 minutes. 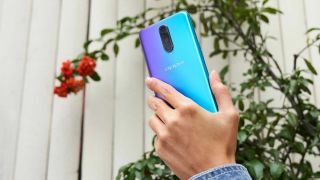 While on Monday, Gizmochina also reported that the Oppo R17 Pro was pitted against 59 different smartphones and came out on top beating the second best by nine percentage. It managed to get 92% charge in just 30 minutes. The smartphone features a 6.4-inch Full HD+ AMOLED display with a waterdrop notch. Its bezels are fairly thin, allowing a screen-to-body ratio of 91% and with all that glass on the front, Oppo has added a Gorilla Glass 6 for protection. Oppo has added an in-display fingerprint sensor that is claimed to unlock the phone in 0.41 seconds. As mentioned above, the R17 Pro runs the Snapdragon 710 chipset with 8GB of RAM and 128GB of inbuilt storage. It comes with Android 8.1 Oreo with ColorOS 5.2 skin on top. For imaging, the R17 Pro has a triple-camera setup on the back and a single selfie camera. The rear camera has a 12MP primary sensor with variable aperture from f/1.5 to f/2.4 and a 1.4-micron pixel size paired with a 20MP sensor with f/2.6 aperture and a third lens that is a TOF 3D stereo camera that assists in depth effects among other things. On the front, it has a 25MP camera that’s said to be powered by AI features. The rear camera setup features optical image stabilization, Dual Pixel AF, and an Ultra Night Mode that uses AI-based algorithms to optimize low-light images. The Oppo R17 Pro has a 3700mAh battery with VOOC Flash Charging tech. It supports dual SIM and has all the basic connectivity options. It will be available in Radiant Mist and Emerald Green color variants. Amazon is offering up to Rs 18,000 cash back on the exchange of an old smartphone. Oppo and Reliance Jio have partnered to offer up to 3.2TB of 4G data to customers buying the phone and recharging with Rs 299 for 32 recharge cycles. Oppo has also extended a one time screen replacement offer at Rs 990. Additionally, there is a 10% Instant Discount with YES Bank Credit Card EMI.